If there were any questions of a return to the MK Dons fold for Dean Lewington, they were given short shrift by Robbie Neilson on Saturday. Despite long-term injuries to Joe Walsh and Scott Golbourne - who has returned to parent club Bristol City after his loan deal expired - suggestion of MK Dons' longest serving player coming back into the squad was called for by many fans in the Twittersphere. However, that is likely where it will remain as Neilson rebuffed questions about a return for the 33-year-old. "We're looking to recruit in that area," he said, with no mention of his former skipper. "We'e got a number one target so we're trying to push that one." At the start of December, Neilson said Lewington was likely to leave the club in January to find first team football, but his tenure at Stadium MK didn't even last that long. A dispute between player and manager led to Lewington to begin training with Charlton Athletic and former boss Karl Robinson. 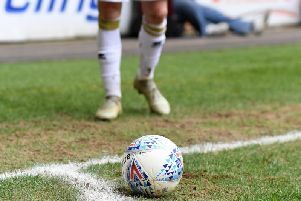 Lewington's latest contract, a two-year deal signed in the summer, came late in the day with his previous deal having expired before he put pen to paper and questions were already rife around his future and his ability to keep pace in League 1. Neilson felt it was important to keep Lewington among the squad, but acknowledged he would be edged out of the side. "I had a chat with Dean at the start of the season about his game time and what I felt it would be and Dean feels he can still play week in, week out," Neilson explained. "I didn't think he could do that." Lewington's last start came at the start of November in the 4-3 win over Oxford in the Checkatrade Trophy. Guilty for two of the goals that night, he had been limited to just nine games until then, and played just once more, coming on as a late substitute in the 1-0 win over Fleetwood four days later. Not the player he once was, Lewington's slide down the pecking order was inevitably coming at some stage, despite the sentiment he carries in the stands. As the sole surviving member of the team to move up from the capital in 2003, Lewington is the club's leading appearance maker and was captain for nearly 10 years. But even down to just four fit defenders, Neilson is looking outside for cover rather than ending Lewington's exile, making it increasingly difficult, if not impossible, to see a viable return for him - proof, if more were needed, that his card is marked.